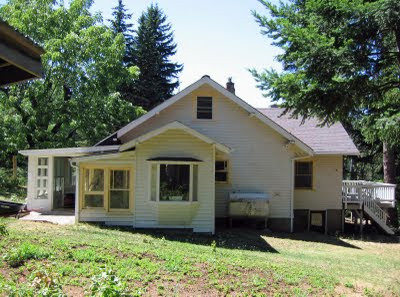 This is what the east side of the house looked like when we moved in. As you can see, several quirky additions had been made to the original footprint of the 1923 farmhouse. We tore down the small appendage with the bay window and built a larger dining room in its place. Also, we tore down the 70's style front porch addition and added the wraparound porch. Two new dining room windows offer a nice exterior detail. 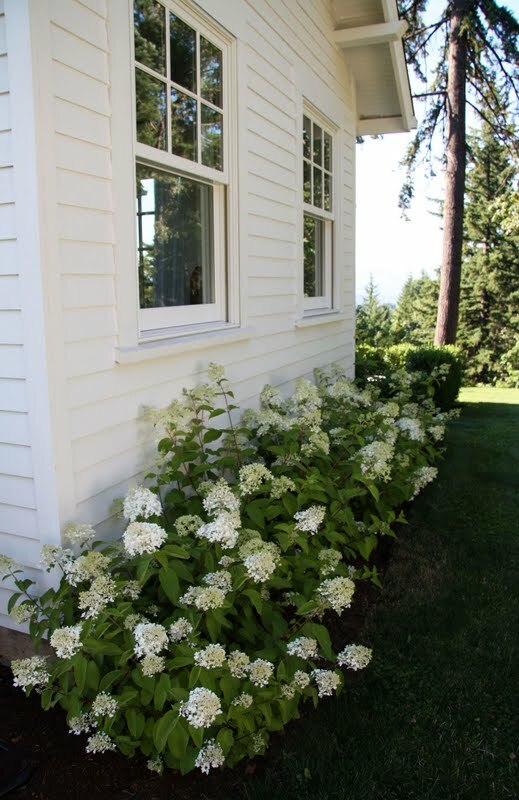 I planted a hedge of Little Lamb hydrangea underneath these windows. They are a sun tolerant variety but I found (when they were planted in the front bed last summer) that they really do much better with some shade. The Little Lamb hydrangea look very similar to a new variety of hydrangea that I planted in front of the dining room. The new variety is called 'Bombshell' and is also sun tolerant. Trina, honestly I never get tired of looking at your farmhouse and the beautiful pictures inside and out.....I LOVE your yard, it is so dreamy; I know you all worked hard to transform it to where it is now, everything is gorgeous and so peaceful looking! Looks absolutely gorgeous Trina - so homely and welcoming, and the detail in the windows is just divine! 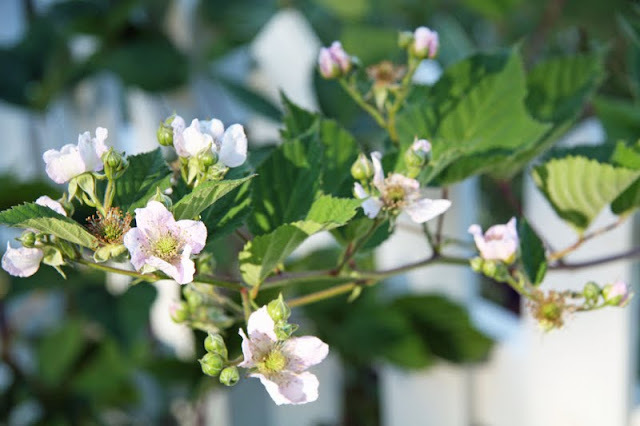 What sort of blackberries do you grow in America? Blackberries are a huge pest/weed problem here in Australia so everyone is rather reluctant to grow them. Although because they're such a pest we have gullies full of them, just have to be careful they haven't been sprayed before picking them! Wow! It almost looked a bit churchy before. You've done such a beautiful job. And how delightful that your twins may be able to spot deer in their garden. They are blessed to grow up in such a wonderful space. Wow! That is incredible! You did such a great job! Want to come and fix up our house? I love wrap around porches. Your home is so bright and cheery - it's awesome what you've done! Trina, what great improvements you've made to the house! The hydrangea bushes are beautiful. Are they a low-growing variety? We have a spot under a window in full sun where the Bombshell hydrangea might work. It gets a lot of HOT summer sun though. We just went blueberry picking on Sunday, and I'll be posting about it this weekend on my blog. The bushes were so tall -- it was hard work, but worth it! I could just reach in and pick one of those berries right off the tree. the windows look beautiful and with a green green grass like that to look out to and the gorgeous white outdoor setting to sit at - you have the ahhh factor. You did a great job - your house looks charming! Trina, what an improvement! All you have done to your home is wonderful and I am so glad you share glimpses in to your life! everytime i see exterior shots of your gorgeous farmhouse i want to get out my painting supplies. the heat keeps knocking us back down though. your home is gorgeously gorgeous trina!!!!! Very beautiful! I love the hydrangeas! Your house always looks so clean and perfect! You have done such a great job with this house..
Wow! Your farmhouse is amazing. I, like you bought an old 1920's house and the renovation is ongoing... I just went through a lot of your previous posts. You have been busy! I now follow you as a source of constant inspiration. Thank You!! Simply gorgeous! I love the simplistic approach to renovating your home, really a true example of less is more. Absolutely gorgeous! You were so wise to increase the size of the dining room and add those windows. Your home and yard are beautiful! What can I say! Beautiful, beautiful, beautiful! I grew up on a farm/ranch. The house never looked this gorgeous. But ooooh, I'd love to use some of these interior and exterior ideas in that same house today. Totally awesome! Your home now is a jewel from every vantage point. Just beautiful! I love that you share the transformation of your home with us! Stunning, as are all your changes. 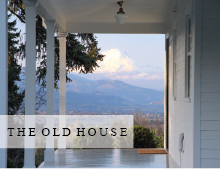 Your farmhouse is absolute perfection. Every change you have made is stunning. Tell us about the new patio furniture. Do I spy wicker? gorgeous!!! would you be able to post some gardening tips sometime? your house and garden is such an inspiration to me - i need to redo my yard cause it's an eyesore for me and i unfortunately have a completely black thumb! the only thing that successfully grows in my yard are weeds ...bleh! I know I've told you a hundred times, but I am always sooooo impressed with the amazing vision you had for your stunning home- a work of art! p.s. the new chairs and table look great!!! Trina, What a beautiful farm house and garden! You have done a fabulous job on the transformation. BEAUTIFUL!! It's so encouraging and inspiring to see the before pictures as well as the after. Sometimes it's hard to have a vision of what things COULD be, but by seeing how some one else transformed a room, house, or garden, is so helpful. I like the changes you made to your house - it looks so nice! I've never seen UNRIPE blueberries until seeing your photo - very interesting. :) I got some "fresh" (LOL) blueberries from the store the other day, I'm going to make another batch of freezer jam. What a beautiful home and garden! You both have done such a remarkable job! Your landscaping is to die for! This is "THE COUNTRY FARMHOUSE"
I spy a new table and chairs on the dining patio! You have created such a lovely home. I really can't wait to see it dressed up for Christmas...in my mailbox! Could not be more beautiful...every detail. You have done a remarkable job on the farmhouse. It is just beautiful. 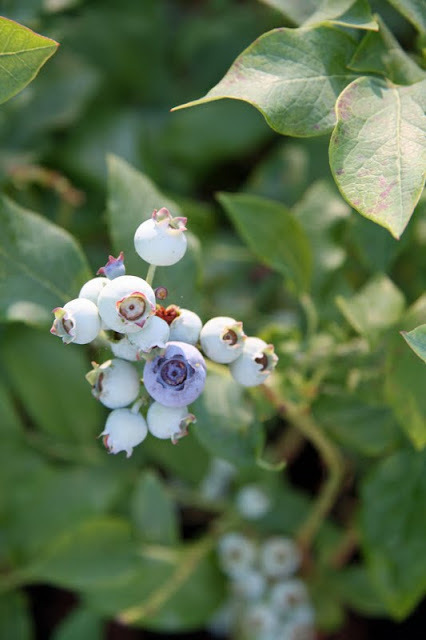 I really enjoyed looking at the photo's and your blueberries are looking good. 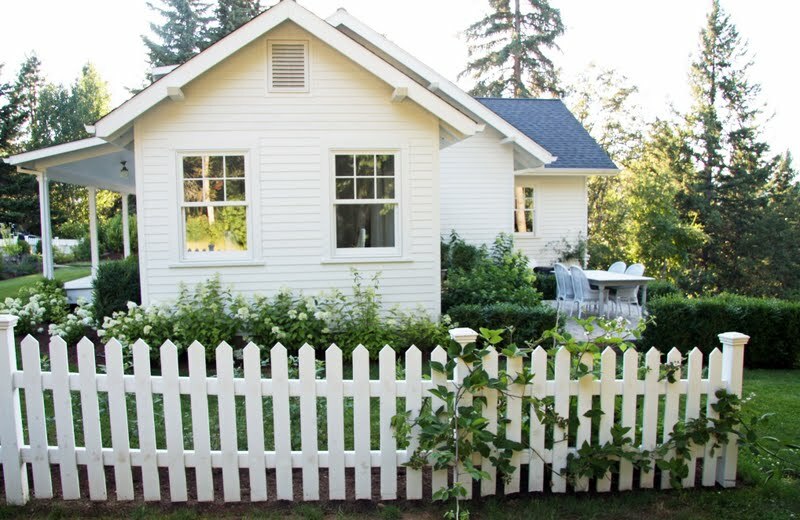 lovely ...I want a white picket fence ! Inspiring and inviting on so many levels! If I were there, though... the deer would not be alone in pre-harvesting. Thank you for the virtual welcome into your home. The work you have done on your home is just lovely. I love all the hydrangeas that you have planted. 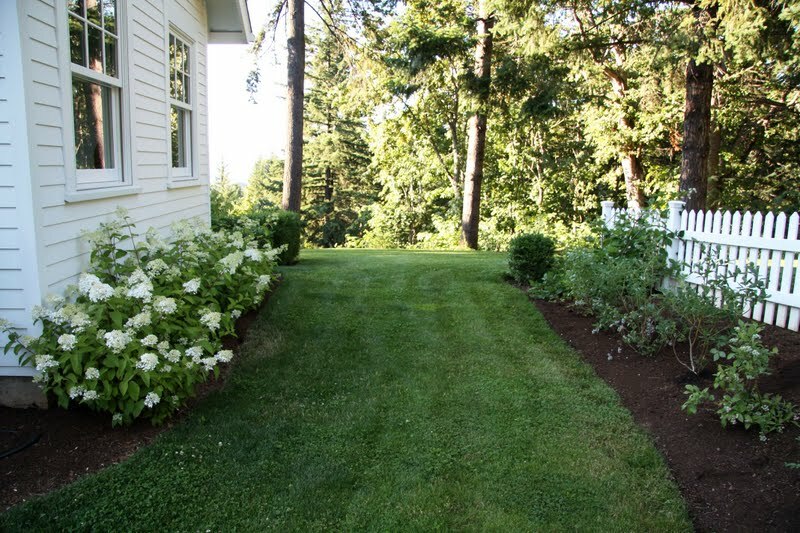 I have Endless Summer hydrangeas planted at our cottage in Maine. They wilt every afternoon from the sun but perk back up later in the day. Unfortunately, they are the only blue hydrangea that will tolerate the winters in our zone. What a pleasant looking house and a lovely garden too! Coming over from the open house party. I am in an old farmhouse too and wouldn't have it any other way. After looking at your kitchen counter tops, I think a trip to Ikea is in my future. Wow - I love your farmhouse too!!! We have a 150 year old farmhouse, and are constantly working on it too! (altho I am curious, what is a 1970 porch - I think we have one!!!) I wish I knew more about architecture, because when we were redoing things you could see where the old trim HAD been, when they put up the new "modern" stuff! But it is hard to find out what kind of trim, or what kind of windows they had way back then! Also love the photos you have of your house, they look wonderful too! And love the wrap around porch too, wish I could figure out how to add one to our house! Thanks for sharing!!! I'm always so inspired by the renovations you've made to your home. It makes me think that one day we'll be able to transform the exterior of our home to reflect its warm interior. You have given your house a sense of place and soul! I love what you have done with your home! Removing the bay window did wonders & the white on white exterior gives it an authentic farmhouse feel. Nice work! Your house, yard and flowers are just beautiful. Congrats on the Country Living shoot...Christmas in July indeed! Thank you for opening up your life, beautiful home and family! You give others hope we can do it! Blessings on your sweet twins! I think I am echoing everyone....but what can I say? So beautiful...all of it!! You certainly have a lovely home and gardens! Simply classic and yet so breathtakingly beautiful.